For most of the descent of the Four O’clock ski run the Sawmill Creek townhomes for sale lie parallel to it, and it’s not until the end of the run – when skiers arrive from Peak 8 at Park Avenue in downtown Breckenridge - that the creek makes it way alone, and scuttles under a bridge heading to the Blue River. About 500-yard above town, a small footbridge over this creek allows skiers into Sawmill Creek Village townhomes. The slightly less romantic directions to this group of 18 townhomes is to drive up Ski Hill Road one block from downtown, turn left and make a quick left again into this short cul-de-sac. 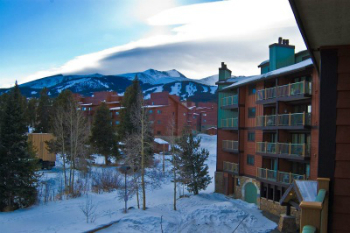 Start your search with the Sawmill Creek townhouse listings below, or keep reading about living in this Breckenridge neighborhood. Sawmill Creek Village homes are wood construction, compact, with the garage on ground level, living area a half-flight up and bedrooms above. These homes are laid on the land as clustered singles or in pairs. They all have attractive craftsman-style wooden garage doors at the end of short driveways off the quiet cul-de-sac. Between a few of these town homes is the bridge to Four O’clock run, so any home for sale in Sawmill Creek is ski-in. A quick walk – less than a block – back to Ski Hill Road brings you to the bus stop, where you can meet the free shuttle that runs directly to the base of peaks 7 and 8. Along this route, you’ll also have the option to stop at the Breckenridge Nordic Ski Center. Off the north side of Ski Hill, is the trailhead for the Pense-Miller Trail that leads up Shock Hill and to the Cucumber Creek Wildlife Preserve. Also just north of Ski Hill on the downtown side is the terminus for the gondola, and the supermarket is a block farther, and the public rec center a few blocks more. The rec center has a lap pool and all the usual equipment, and indoor and outdoor tennis including two outdoor clay courts. Size: 1680 sq. ft. to 1992 sq. ft. Amenities: garage, basement, on the ski trail from Peak 8, walking distance to downtown, on the bus route, across the road from other in-town trailheads. From the traffic circle on the north side of Breckenridge exit onto Park Avenue and continue about .5 mile to Ski Hill Road, turn right and take the next left on Sawmill Creek Road, then immediately left into Steamside Circle. The townhomes are around this cul-de-sac. An expert from the Breckenridge Associates team is standing by to discuss your real estate opportunities in Sawmill Creek and beyond. Contact us today.